Mark your calendars- Thanksgiving 2019 is November 28! Join us this year for the annual Clark County Turkey Trot benefiting Clark County Food Bank. 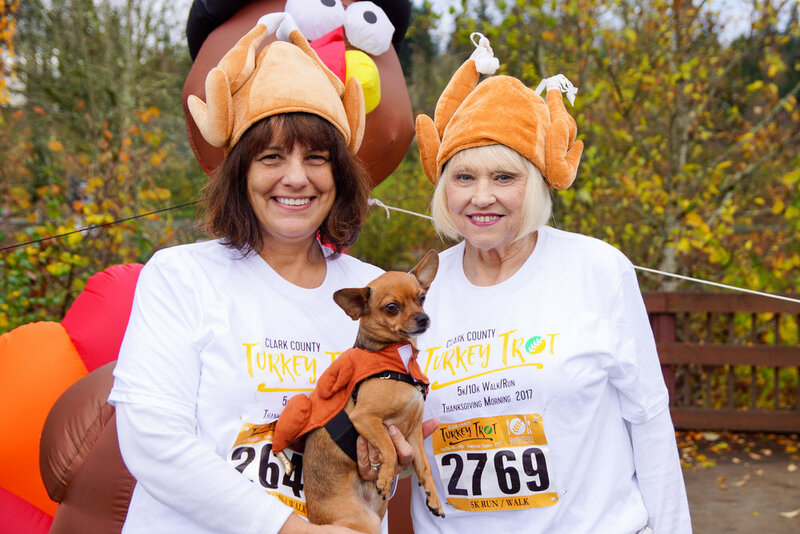 With 100% of the race proceeds donated directly to Clark County Food Bank, Turkey Trotters raise enough funds each year to provide over 100,000 meals to the hungry in our community. Whether you are a marathoner, power-walker, Jr. jogger, or somewhere in between, Turkey Trot is a great way to give back and earn that extra slice of pie. A fun, family-friendly 5K run/walk and 10K run. If you’re feeling brave, join in on the Polar Plunge into Klineline Pond! Turkey Trot would not be possible each year without the help of amazing volunteers, we have opportunities to serve leading up to Turkey Trot as well as the day of. Click the button below to see all the volunteering options, and one our of volunteer coordinators will be in contact with you shortly. Come dressed in wacky or Thanksgiving-themed costumes to win special prizes! For more information on race details, where to park, links to past years’ photos, and more- visit www.Turkey-Trot.org. To stay up-to-date on all things Turkey Trot, as well as see post-race photos and race times, follow Turkey Trot on Facebook.